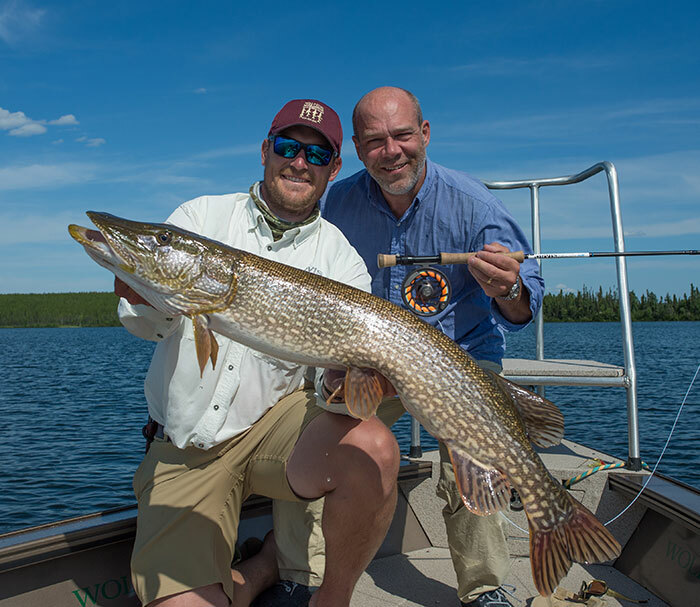 Our second day at Wollaston Lake Lodge (click here for a report on the first) promised weather much like the day before–80 degrees and sunny–and we were looking forward to trying to find some bigger fish. As an added bonus, we were joined by lodge owners, Mike and Judy Lembke, who also happen to be the parents of our guide, Dan. 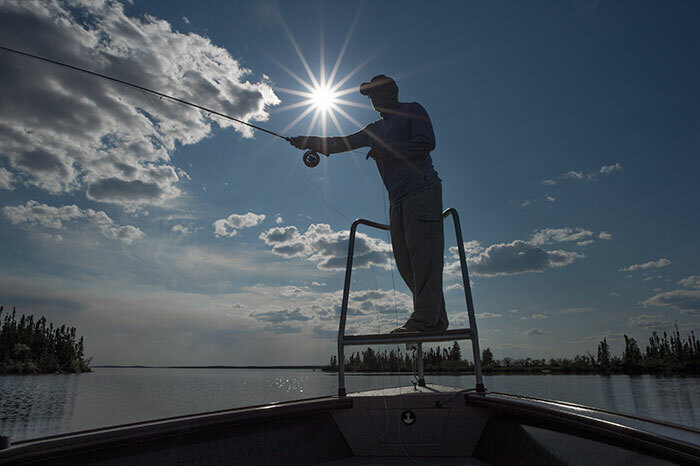 For two days, the sun has made this northern lake feel more like the bonefish flats of The Bahamas. After a 45-minute boat run, we entered what the guides call the Bay of Pigs, which seemed to bode well. But, just like yesterday, things started off slow. Soon, we were on the move, and Dan next set me up off a submerged rock pile. 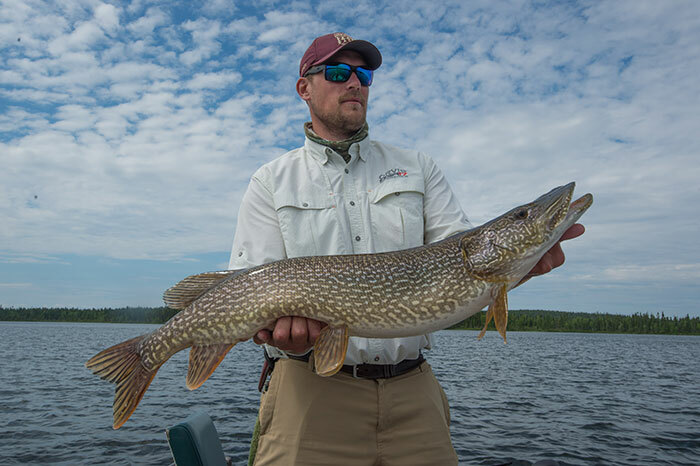 On my first cast, I stuck a nice pike in the 30-inch range, and we got several more follows, as well as a few short strikes. The fish just weren’t ready to commit yet. Mike Lembke proudly photographs his wife, Judy, and her 45-inch northern. 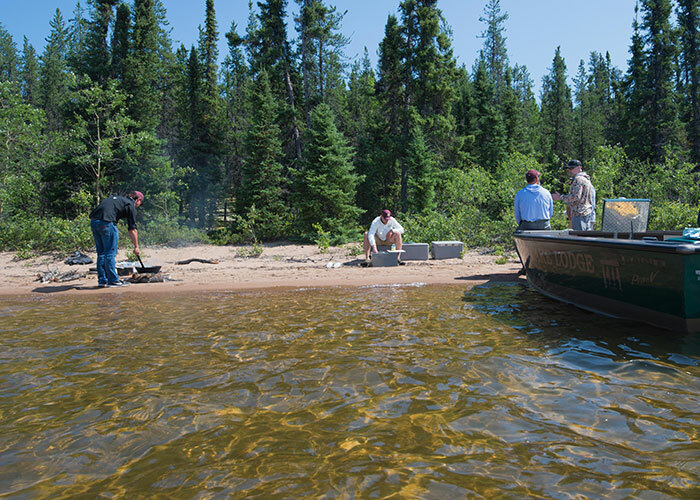 The shore lunch was an impressive display of wilderness cooking. We caught and kept a couple smaller pike for shore lunch and beached the boats. The guides–Dan, Phil, and Spencer–leaped into action in a carefully practiced sequence of fire-starting, gear-unpacking, and food preparation. Within about 20 minutes, they had prepared a delicious stir fry of deep-fried pike nuggets and vegetables, plus some of the best french fries I’ve ever eaten. 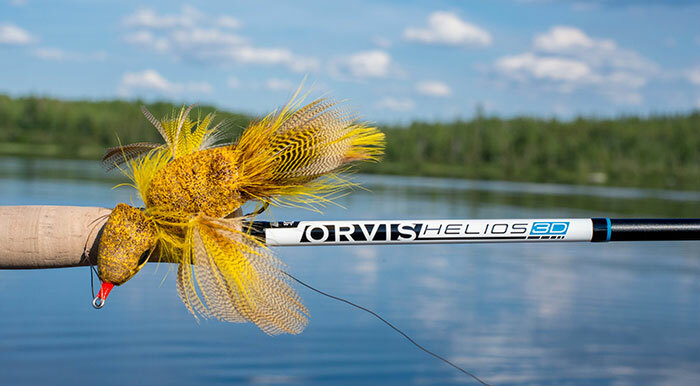 Sandy’s 42-inch fish put up a tough fight and was the reward for a lot of casting. Later, Dan took us to several great bays, where we continued to catch fish in the 30s, but we still couldn’t find that big girl. Finally, however, Sandy hooked laid into a fish that just wouldn’t give up the fight. We we got a good look at it, we knew it was the kind of pike we’d been after. When we put the tape to her, she measured 42 inches, a real trophy. Pat Cohen’s Mallard Duckling fly didn’t produce a fish, but we still have hope. At the end of the day, when the sun had become truly punishing and the fish had become lethargic, I asked Dan if we could go somewhere to if we could tempt something to the surface. I tied a pattern I’d ordered specifically for this trip: a monstrous duckling pattern by Pat Cohen. It looks kind of silly when you’re casting it, but once its on the water, you can see why a fish would eat it. Sadly, nothing did. The next two days call for rain, and my goals are to get my own 40-incher and to tempt something into eating that duck. Stay tuned.